Hengduan Mountains Biotechnology operates two nurseries in China, one in the high mountains of northern Sichuan, and the other on the hot Sichuan Plain on the outskirts of Chengdu city. The high mountain nursery is located nearly within the boundaries of Huanglong National Park in a deep valley at around 3000 meters elevation. Here the winters are cold, long, and dry, extending from November through March uninterrupted. Summers are cool and wet with most days overcast and temperatures rarely, if ever, above 25 C.
In this climate Holger and Wenqing Perner have their temperate ladyslipper orchid nursery. Several long shadehouses containing thousands of Cypripedium seedlings as well as adult stud plants make up the bulk of the nursery. Native Chinese Cypripediums flourish in these conditions. In late June 2013 I visited the nursery on one of Wenqing and Holger’s botanical tours of the region. What follows is a pictoral essay showing what was in bloom at the time of our visit. Just couple kilometers up the highway from the nursery is Huanglong Valley, home to literally thousands of Cypripediums, especially C. tibeticum, C. flavum, and C. bardolphianum. For this reason it isn’t surprising the local climate is perfect for growing Cyps. The plants are grown in a mix of four to five parts perlite to one part sedge peat taken from the alpine grasslands of the region. In this mix the plants flourish in beds overlain with conifer needles. Lets take a look at some of the plants we saw at the nursery the day we visited. This lovely white based colored C. tibeticum is one of their stud plants at the nursery. As you can see, this form lacks the white rim around the lip orifice. Flowers of this type are the largest of the this variable species. If you buy plants from them, then expect flowers similar to this one. C. flavum is a common, yet endemic orchid of western China, found only the cool wet conditions these high mountains can provide. Flower color is highly variable form pure yellows, to near white flowered ones, as well as spotted flowers such as this lovely plant at the Huanglong nursery. A challenging group of Cypripediums to grow are the spotted leaf types (Sections Trigonipedia and Sinopedilum). Here are clumps of C. sichuanense (left) and C. bardolphium (right, out of flower) growing with abandon. These plants cannot withstand wet conditions in winter and so must be protected from winter rain and snow. With their home-base in the capitol city of Chengdu, Sichuan, Wenqing and Holger Perner own and operate Hengduan Mountains Biotechnology, LTD. – a real boon to those interested in the native orchids of China and southern Asia. Currently, no other private company can offer what Hengduan Mountains Biotechnology does. They sell (with proper documentation) a wide array of orchids from China including many Paphiopedilum and Cypripedium species. They also lead botanical tours into the wilds of China featuring incredible landscapes, a dizzying array of native plants with particular focus on orchids, delicious local cuisine, and of course the cultures of the people who live in these far flung places. And that’s just for starters, so why don’t we have a closer look at this truly unique company. Huanglong National Park in northern Sichuan is home not only to thousands of orchids, but its travertine limestone pools and waterfalls are beautiful beyond imagination. This amazing place was the first major stop on a botanical tour I took in June 2013 hosted by Holger and Wenqing Perner. Dr. Holger Perner is a world known German botanist and orchid specialist, and has worked at Huanglong National Park in northern Sichuan as senior consultant since September 2001. Wenqing, his wife, an accomplished businesswoman and linguist, is fully fluent in English, Japanese, German, and of course her native language, Chinese. They met in Sichuan in 1997 on a botanical tour, were married a year later, and moved to Sichuan (Wenqing’s homeland) full time in 2001. They have two lovely daughters, Stefanie and Isabell. Since 1999 Wenqing and Holger have been leading botanical tours to see western China’s rare plant flora. 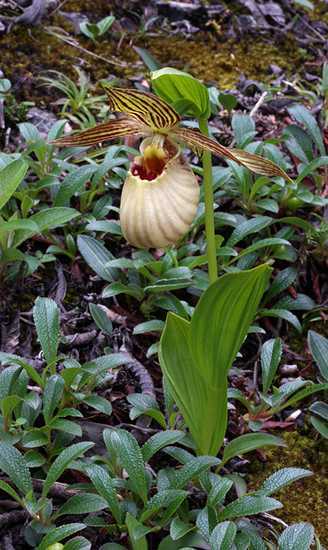 In 2010 these tours were extended to the subtropical and tropical mountains of southern China where a number of Paphiopedilum species can be seen. In May of the same year they finally got the go ahead to export CITES protected orchids (both Appendix II and Appendix I) out of China, making it possible for people to legally possess such species as Paphiopedilum hangianum and P. tranlienianum (both Appendix I) for the first time outside of their native lands. Wenqing and Holger also travel extensively throughout the world attending orchid shows, and giving talks to local orchid societies. I have had the great fortune of personally knowing both of them for some years now. In the summer of 2013 I took it a step further by attending one of their botanical tours to northern Sichuan where I got to know them even better. The experience was beyond my expectations. We were treated to 10 eye popping days in the Min Mountains of Aba Tibetan Qiang Autonomous Prefecture, followed by a visit to their nursery on the outskirts of Chengdu and to the ancient town of Huanglong Xi on the last day. The Hengduan Mountains are home to a dizzying array of plant species as well as endangered wildlife, such as the giant panda bear. 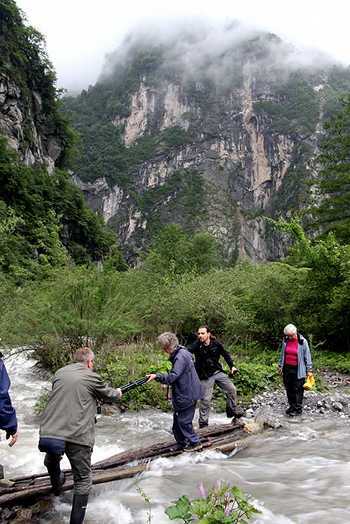 Here tour members are crossing a mountain torrent in the scenic Danyun Gorge. From June 20th-30th myself and 11 other plant enthusiasts from around the world were escorted around northern Sichuan by Holger and Wenqing personally. A typical day was spent traveling by tour bus to highly varied habitats in the deep valleys that are made by the massive northern Hengduan Mountain Range on the very eves of the immense Tibetan Plateau. We stopped whenever something of interest was seen – everybody would then file off the bus and the cameras would come out. In addition to these frequent stops, we visited no less than six botanical Edens on the tour, spending an entire day at each of the most choice places. Washingtonia robusta, the Mexican fan palm, is perhaps one of the most commonly planted palm trees around the world, and yet its native home in northern Mexico is limited to a relatively few water canyons scattered here and there in Sonora and Baja California. Rows of it’s dizzyingly tall, slender trunks topped with a relatively small crown of fronds are the icons of southern California’s older neighborhoods – it’s hard to find a photo of Hollywood that doesn’t include at least a few. So how did this relatively scarce palm become so widely grown throughout the world’s warmer climates? The answer is simple – this is a very tolerant, fast growing palm. 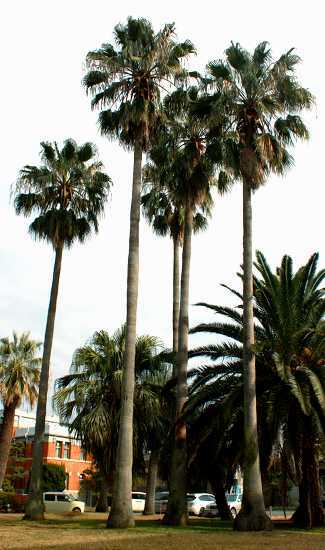 A fairly tall group of Washingtonia robusta growing at Kyushu University's Campus in Fukuoka, Japan. Washingtonia robusta is a denizen of water canyons in otherwise desert to semidesert regions. It is one of the tallest palms in the world, commonly topping 15 meters, with exceptional specimens growing an additional 10-15 meters higher. Its unbranched gray trunk is generally quite slender, usually not more than 30 centimeters in diameter, but swells considerably at the base. It is ringed by close set leaf scars and in tall trees tends to curve a bit as it ascends in long, lazy arcs. 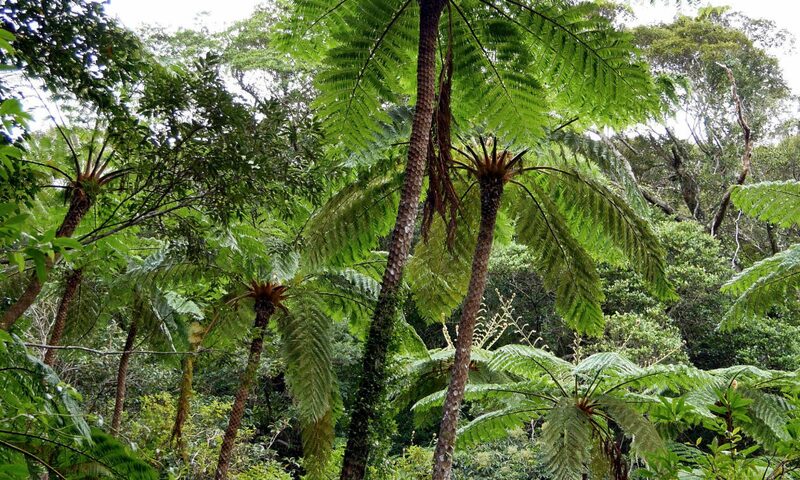 The glossy fronds are palmate in form, are rich green in color, and have hanging leaflet tips not unlike Livistonia chinensis, though not as pronounced. The fronds are quite large, a bit longer than wide, with mature fronds growing up to 1.5 meters long. They form a large round crown, and tend to remain attached to the trunk even after they die, creating the tell-tale skirt common to this genus. The petioles grow up to a meter long and are host to rows of large orange hook-shaped sawtooth spines. In spring and early summer long sprays of tiny white flowers are produced on hanging branched flower stalks that grow beyond the limit of the crown, each extending up to 3 meters in length. 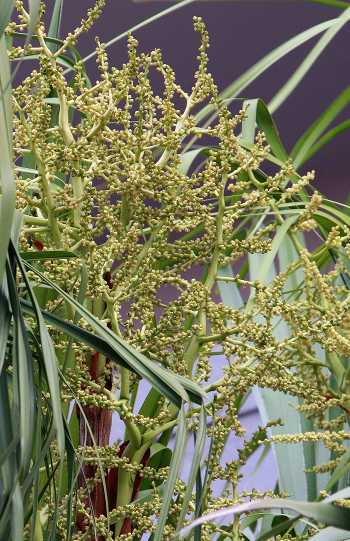 By the fall thousands of small dark brown fruits are produced on them, making this palm a potential weed in the right climate. The Mexican fan palm is found in nature in seaside facing water canyons and oases near the coast of Sonora (generally north of Guaymas) as well as Baja California. Its range is by no means continuous, but rather highly scattered, suggesting a remnant distribution from a time when conditions allowed it to be more widespread. Its northern distribution is close to its sister species, Washingtonia filifera, but apparently they never are found growing naturally together. The crown of the Mexican fan palm is slightly taller than wide. This tree has been trimmed of its dead fronds, hence it is lacking the "skirt" of unpruned trees. The flower stalks however were not trimmed this season, so you can see the bunches of dangling brown fruits ready to fall and germinate in droves or be eaten and dispersed by birds. 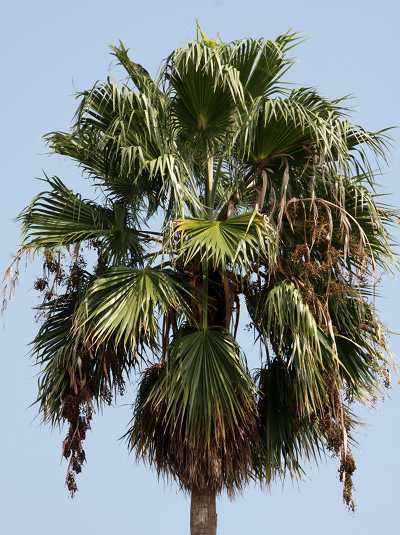 In spite of its rather restricted native distribution, this palm is far from rare these days, in fact in many places it is considered a potential pest. In parts of central and southern California it has naturalized itself such that the California Invasive Plant Council considers its impact on native ecosystems a “moderate risk”. Many people who have grown this palm and let it go to seed have found out just how easily it spreads, sometimes forming “lawns” of seedlings. It is not uncommon to see young trees growing literally in the cracks of concrete walls and sidewalks. China’s Hengduan Mountains are home to a host of endemic lady slipper orchids with Cypripedium bardolphianum being among one of the oddest. This dwarf plant stands at most hand high, and while its flowers are hard to describe as showy, the plant has appeal in many respects nonetheless. Certainly it is more attractive than its moniker would suggest, being named after a warty nosed Shakespearean character. It is one of three species in Section Sinopedilum, all being confined to the mountains of western China. Cypripedium bardolphianum is a dwarf slipper orchid confined to the Hengduan Mountains of western China. Cypripedium bardolphianum is a dwarf herbaceous terrestrial orchid of mossy, thin woodlands in high mountain valleys. The plant appears to have an even pair of broad leaves borne opposite to each other, but in fact only one is a true leaf while the other is a oversized floral bract. They are nearly hairless, usually are no more than 5-6 centimeters long each and half again as wide, and grow at ground level. They can be pure green, lightly spotted with purple-black, or flushed with purple (usually near the leaf margins). Growths are produced along a branched, creeping rhizome with new buds initiated several centimeters apart. For this reason they form extensive, loose colonies. The single flower sits at the end of a short stalk, just a bit taller than the leaves which tend to stand upright during flowering, with the whole plant typically not being much more than 10 centimeters high in total. Since the second “leaf” is in fact the floral bract, the flower is presented unaccompanied at the end of the stalk. The flower is small, around 2 centimeters across, and has a strong, astringent smell. The lip is cup-shaped with the outermost end pointing nearly directly upwards. 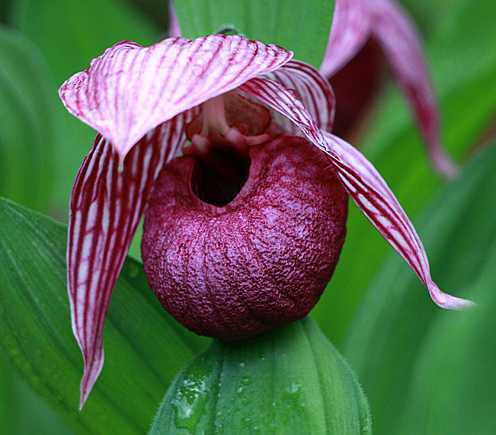 The lip orifice is depressed giving the flower a bowl-like shape, uncharacteristic for a Cypripedium. The staminode is large and broad. The sepals and petals are quite stout and broad, and all cup around the lip, as though protecting it. The ovary is often adorned with purple hairs along its ridges, especially in dark colored flowers. The leaves of Cypripedium bardolphiaum can be totally green, flushed with purple, or lightly spotting like this plant. Check out this video of Cyps in the wilds of northern Sichuan, China. Plants featured include C. bardolphianum, C. calcicola, C. fargesii, and C. sichuanense… to mention a few. 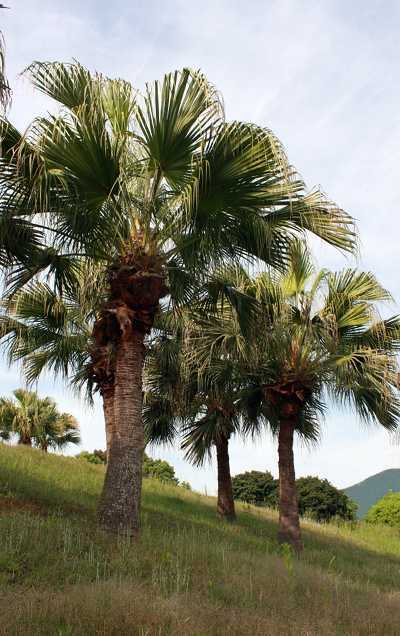 Livistona chinensis is one of the more cold hardy palm trees commonly in cultivation, and yet ironically is native to the essentially frost free subtropical islands and coastlines of China, Taiwan, and southern Japan. This palm is better known by its common names, the Chinese fan palm and the fountain palm. The former name comes from its palmate leaf structure, while the latter is due to the frond’s hanging apical lobes that create a falling, fountain-like appearance. Without a doubt, this palm is the most commonly grown Livistona species in the world, and given its beauty and cold-hardiness, it deserves a closer look. Livistona chinensis or Chinese fan palm makes a lovely landscape specimen. The Chinese fan palm is a tall trunk forming palm of coastal and island forests amidst warm, subtropical seas, commonly forming monospecific groves. They typically stand no more than 10 meters tall, but large specimens can approach 15 meters. The gray to brown trunk is usually not more than 30 centimeters in diameter and is essentially naked since the petiole stubs tend to fall away quickly once old fronds are shed. The fronds are costapalmate (having long costa extending up the center of the palm-shaped leaf), up to 200 centimeters long, nearly as wide, and can number 50 or more forming a dense crown. The thin, long apical lobes hang perfectly downward giving the crown a pleasing, fountain-like appearance. The petioles are stiff and highly serrated with sharp brown spines, and are 150 -180 centimeters long. The trunk is unbranched and strong, being quite capable of withstanding intense typhoon winds that haunt this tree’s native shores. This palm is hermaphroditic, bearing both male and female flower parts. The subglobose (nearly spherical) yellow-green flowers are born on relatively short, branched flower stalks in the early summer. These never grow beyond the confines of the crown, and so remain relatively unseen during flowering. The blue-black olive-like fruits range from subglobose to ellipsoid and usually are fully ripe by early winter. Seed production can be copious, making this species a potential weed under the right conditions. In nature this stately palm is never found far from coastlines, in fact its habitat is restricted to the sandy southern shores and islands of the South China Sea, northward to the East China Sea, and east to the immediately adjacent parts of the Pacific Ocean. Historically it was found from southeastern China (Hong Kong, Hainan Island, and Guangdong Province), Taiwan, many of Japan’s Nansei Islands (Yakushima, Tanegashima, Okinawa, Iriomotejima, and Ishigakijima), northward to the Korean Straight (Okinoshima), along the Pacific coast of Kyushu (Aoshima), a few coastal areas of Kyushu (Cape Sata and Cape Toi) and Shikoku (Ashizuri Peninsula), as well as the Bonin Islands (Ogasawara Islands) in the Pacific Ocean. The small spherical flowers are borne on short branched stalks that do not exceed the limit of the tree's crown. It also is native to Uotsurijima of the Pinnacle Islands (called the Senkaku Islands in Japanese and Diaoyu Islands in Chinese) where apparently it forms near continuous stands on much of the island. The fate of this population is uncertain given the hotly contested status of this tiny island chain, but it seems that the non-native goat population poses a more immediate threat for the entire island’s ecosystem. This palm has suffered range restriction due to human activity throughout its native distribution, particularly where it is found on mainland areas. Despite its relative rarity in the wild, Livistona chinensis has been naturalized in many places throughout the world including Bermuda, Mauritius, La Réunion, Hawaii, southern Florida, New Caledonia, Fiji, Vietnam, and Java. In Florida it has been listed as a category II plant by the Florida Exotic Pest Plant Council – a designation for species that potentially can become an invasive pest. To date it has not been found to be aggressively invasive there, and is even recommended as a yard specimen in the northern half of the state by the University of Florida’s Institute of Food and Agricultural Sciences (IFAS). In the mountains of western Sichuan, China there exists a curious dwarf form of Cypripedium tibeticum with self pollinating flowers. For years this plant has been shrouded in mystery, initially being given the name C. amesianum, and more recently has been assigned to at least two different accepted species, C. yunnanense and C. ludlowii, by two different authors. Hopefully, I can shed light on this diminutive little plant – what makes it distinct and perhaps even delineating its logical position within the known species of the region. It should be noted that there is no clear name for this plant at the moment, nevertheless I will refer to it as C. tibeticum v. amesianum. Cypripedium tibeticum v. amesianum is a dwarf, self pollinating slipper orchid found mostly in western Sichuan, China. This plant is an herbaceous terrestrial deciduous orchid of sparse woodlands and shrub thickets in high mountains. The plant’s habit is very similar to the more typical forms of C. tibeticum except in stature – often standing no more than 20 cm tall. Beyond that, its most salient feature are the flowers, which are borne one to a stem, and rarely exceed 4-5 cm in natural spread. Their color is fairly normal for a yellow based flower of C. tibeticum, with the lip evenly suffused with a wine red color and striated sepals and petals with a similar hue. The lip tends to be a bit more round than most C. tibeticum, rather than laterally compressed. The lip orifice is lightly toothed as well. Other than size their most distinctive feature is that the flowers are obligate self pollinators. The reason is easily seen when looking at the pollinia which grow directly onto the stigmatic surface of the column. The result is 100% of the flowers forming pods, though of course not all necessarily come to full term. It appears that this odd little plant is confined to the Hengduan Mountains of western Sichuan Province, and adjacent areas of extreme northeastern Yunnan at elevations between 3000-3500 meters. Here it is found growing in open woodlands, shrub thickets, scree slopes, and travertine formations throughout the region often alongside other Cyps including C. bardolphianum, C. calcicola, C. farreri, C. flavum, C. guttatum, C. shanxiense, and C. tibeticum v. tibeticum. When vigorous it can form large clumps, but also grows singly. The existence of v. amesianum has been known for nearly a 100 years. 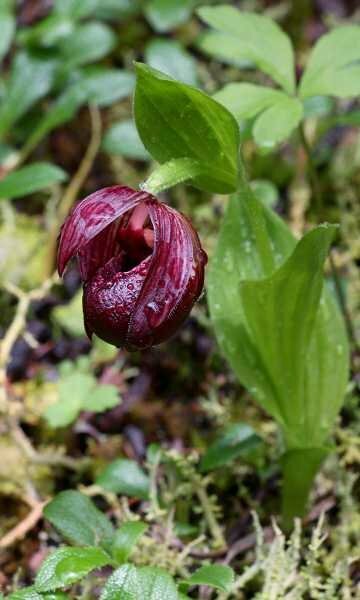 It was first described as Cypripedium amesianum by Rudolf Schlechter in 1919 based on material from two collections made by another famous plant collector of the time, Ernest Henry Wilson, in the vicinity of Wenchuan in Sichuan. Since then plants fitting this type have been found throughout the high mountain valleys of western Sichuan and just over the border in neighboring Yunnan. The flower of Cypripedium tibeticum v. amesianum looks like a miniature form of the larger, more common forms. The flower can also be easily confused with C. calcicola, however that species’ flower never is self pollinating. Unfortunately, the confusion surrounding its taxonomic status has had a more sorted history. After looking at the AMES herbarium specimen, Phillip Cribb (1998) considered it conspecific with C. yunnanense, another diminutive species with C. tibeticum like flowers from the same general region. Then in 2009 Wolfgang Eccarius published it under the name C. tibeticum ssp. ludlowii, thus reassigning the accepted species C. ludlowii, to this varietal status. Slipper orchids are primitive orchids which all share one obvious feature – the lip, or labellum, is pouch shaped. They range across the world, from temperate to tropical regions of every continent except Africa and Australia. What follows is a list of videos I’ve produced about them, focusing at this point on the genus Cypripedium. Enjoy and share them! Lady slipper orchids: what to look for when buying them – in this video you see the difference between healthy and unhealthy Cypripedium stock. With an already difficult group of plants to cultivate, there’s no point in buying plants that are likely to fail regardless of your attention. Cyp. 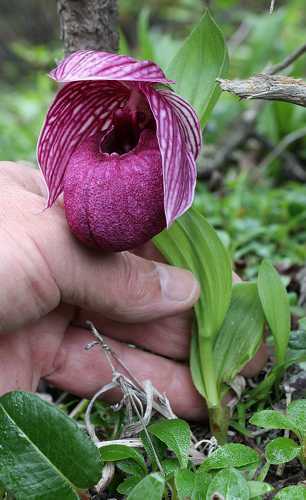 farreri – See this rare endemic slipper orchid of the Hengduan Mountains in western China, known from only 4 locales. I am one of the very few people to have witnessed it in flower in the wild and now you can see them basically as I did. Cyp. 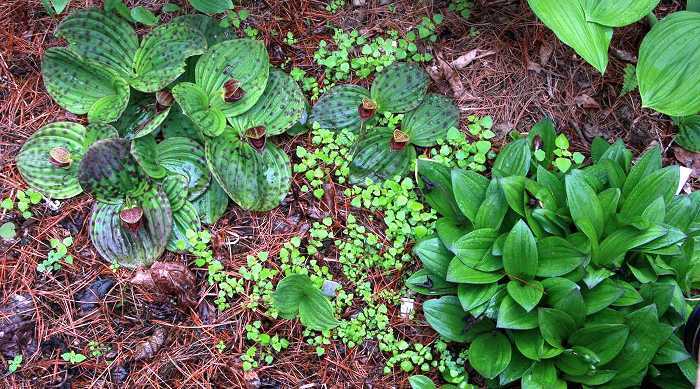 tibeticum – In this video you get to see this highly variable Cypripedium common to western China’s high mountain valleys. It also is one of the most beautiful of the entire genus in my opinion. Here we get to see many different forms of this lovely plant. Cyp. flavum – This rare yellow flowered endemic Cypripedium of the Hengduan Mountains is featured in its native habitat. This plant is similar looking to its North American cousin, C. reginae, but as you’ll see it is quite a different plant. Cypripedium photo blitz! – In this gallery of 69 photos you’ll see the best of my shots of these wonderful plants in the wild. All were taken on a trip to Sichuan, China in June 2013. There is no sound track, just the photos and an index at the end describing each photo and where it was taken. Assorted Cyps from Sichuan – in this video I show a variety of Cyps seen in the wilds of northern Sichuan, China in June 2013. Plants featured include C. bardolphianum, C. calcicola, C. fargesii, and C. sichuanense… to mention a few. 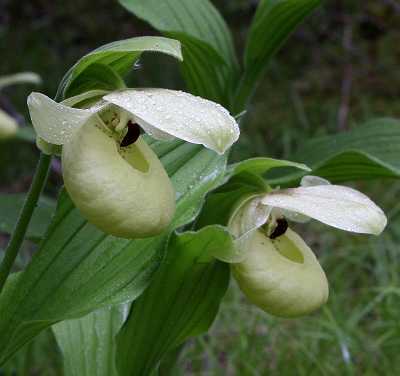 In his book Native Orchids of North America, Donovan Correll wrote of an extremely disjunct population of the showy lady slipper (Cypripedium reginae) said to be found in the mountains of western China. That was an eyeful for me at the time (I was 16) – how could that be? China was literally on the other side of the world! Surely, some strange force was at work here. Years later I learned of the yellow counterpart to C. reginae growing in western China’s fabled mountains, the now well known Cypripedium flavum. These two species are at once highly reminiscent of each other, and yet obviously different, something Correll didn’t notice in the dried herbarium specimens he had examined. Indeed for many years, with the “Bamboo Curtain” fully drawn, many Chinese orchids fell into near mythical status – unknown except by the handful of botanists who roamed those far regions a hundred or more years ago. This is the story of this lovely slipper orchid today. Cypripedium flavum often forms large clumps in nature. Cypripedium flavum is a deciduous, herbaceous, perennial, terrestrial orchid found in thin woods of high mountain valleys. It’s fleshy, densely pubescent stem can grow nearly as high as C. reginae, up to 60 cm tall in large specimens, but is usually two thirds that height. Also, like C. reginae, it bears many pubescent, elliptic leaves, as many as 10 in number, in a alternating pattern up the stem. The rhizome is stout, bearing many thick, light brown roots. Plants tend to clump, with 15 or more stems each, but can occur singly. The flower again is much like in C. reginae, but smaller, having a natural spread of 4-6 cm on average (or as Dr. Phillip Cribb says, “flowers the size of ping-pong balls”). The dorsal sepal and synsepal are very broad to the point of being nearly ovate, the former hanging in a horizontal position like a hood over the lip, the latter, cradling the bottom of it. The petals are more elongate and in most plants tend to recurve backwards. The lip is rather round to somewhat elongate, sometimes having a slight cleft “chin” appearance, and often is laterally compressed. Flower color is variable, usually being a yellow to cream base throughout. The petals and sepals can be flushed, spotted, and striated with varying amounts of purple-maroon color, or can be completely unmarked. The same goes with the lip – it can be highly spotted, lightly so, or not at all. The staminode tends to be deep maroon, but Cribb cites specimens with “butter-yellow staminodes” from northern Sichuan. Alba-like forms have been found as well in northern Yunnan with nearly pure white flowers – except the staminode which retains some purple pigment. Flowers are borne singly, or very rarely in a pair. Cypripedium flavum is a plant of high mountain valleys, found only in western China from northern Yunnan, a tiny part of eastern Xizang (Tibet), throughout western Sichuan, southern Gansu, and western Hubei. It probably also occurs in parts of southern Shaanxi, but is not reported from there. This rare yellow slipper orchid is an endemic species confined to alpine valleys from ~2,300-3,700 meters elevation in the Hengduan Mountains of western China. 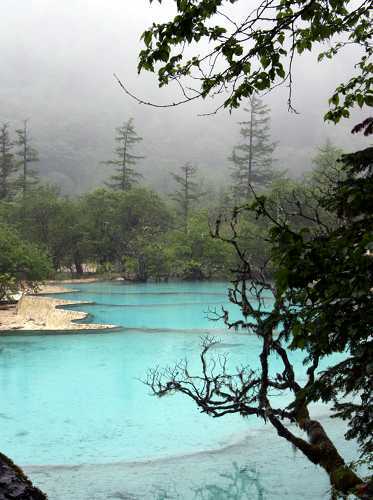 It seems most at home in areas where limestone is near the surface, sometimes numbering in the thousands of plants, such as northern Sichuan’s Huanglong Valley with its famous travertine limestone formations. It can also be seen on limestone scree slopes, in thin coniferous forests or forest margins, in deciduous woods, and in thickets and scrub. 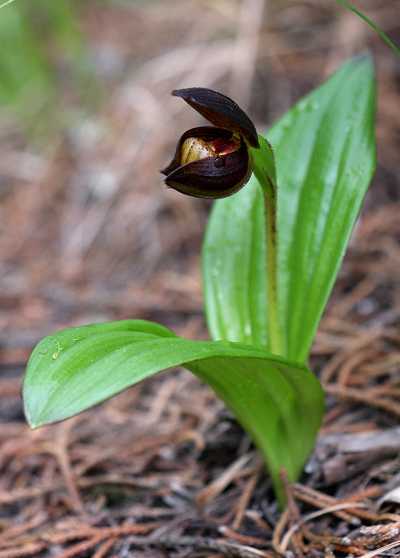 It is often accompanied by other Cypripediums in the wild – typically C. calcicola, C. tibeticum, and C. bardolphianum, and occasionally C. farreri, C. franchetii, C. margaritaceum, C. guttatum, and C. plechtrochilum. “Flavum” means yellow, yet Cypripedium flavum’s flower is typically more cream colored or light yellow. One of the most startling of the Chinese lady slipper orchids is the highly variable Cypripedium tibeticum. Superficially it is similar to the more widespread C. macranthos, and indeed some forms of that species, especially those known as hoteiatsumorisou in Japan, are near dead ringers for the more spectacular large flowered forms of C. tibeticum from Sichuan, China. In a similar way C. tibeticum is as variable as the North American C. parviflorum, making its taxonomy problematic. As a result it has been given any number of names – the bulk of those considered invalid by most authorities. Hopefully in this article I will at least help clarify what plants have been found in nature. Cypripedium tibeticum is a herbaceous, perennial, terrestrial orchid of high mountain meadows, scrub forests, and forest margins. Its thick, glabrous stem can reach a height of 35 cm, but it is not uncommon to find flowering stems half that high, especially in exposed habitats. Each bears up to four pubescent elliptic to nearly ovate leaves, but more commonly just three are present. While single stemmed plants are frequent, in more favorable environments they can form large clumps with 10 or more growing points. Cypripedium tibeticum is often rather short in stature, but as you can see their flowers can be large and showy. Generalizing about the flower is quite a bit more tricky since variation in form and color is extreme. The flower’s natural spread can range from a mere 3 cm to as much as 12 cm depending on the form. More consistent features include a highly corrugated lip surface that is richly flushed with maroon brown to purple pigment, boldly striated sepals and petals, conspicuous hairs on the petals towards their point of attachment, and a mostly glabrous ovary. Flowers are typically born one per stem, however rarely they can be double flowered. Beyond that, it is difficult to talk about similar floral characteristics. Even the often mentioned white ring around the lip orifice is hardly a consistent trait. The various forms I’ve seen or heard about and their characteristics are detailed below. 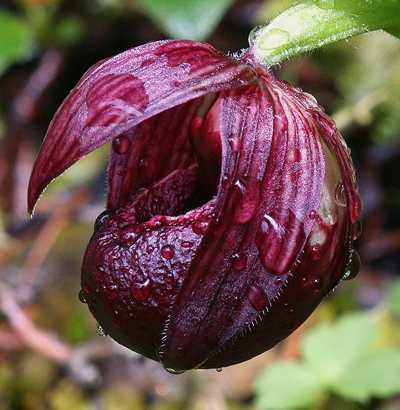 This is one of the more widespread and common Cypripedium species in western China, indeed extending beyond that country’s borders into adjacent areas of northern India (Sikkim) and Bhutan. Within China it has been found from southwestern Xizang (Tibet), northern Yunnan, much of northern and western Sichuan, southern Gansu, and perhaps even parts of Guizhou (according to eFloras.org). Considering its native range is in such close proximity to Arunachal Pradesh (India) and extreme northern Myanmar, there is likely habitat in those areas as well. It is with satisfaction that I can say this species is not in immediate danger in its native range, despite being continuously subjected to collecting pressure from plant diggers. This is a plant of high mountains, having been reported from 2,300-4,200 meters elevation. It can be found on grassy to scrubby slopes and meadows (often occupied by yaks), rocky thin woods, forest margins, on travertine formations, perched on scree slopes, and growing out of cliff faces. It is not found in dense woodlands, but rather is a denizen of open environments. In northern Sichuan I have had the great fortune of seeing it growing in all the above situations from ~3,000-3,500 meters elevation, often accompanied by C. flavum, C. calcicola, and C. bardolphianum, and more rarely C. guttatum, C. shanxiense, and C. farreri. It can form sizable colonies, with many dozens of flowering plants in view, or simply grow here and there in small groups. The seed pod of Cypripedium tibeticum is essentially glabrous and often suffused with purple color. I am happy to report such pods were commonly seen in the wild. As a side note, all of Sichuan’s Cypripediums favor travertine limestone areas. Travertine is limestone produced by the precipitation of carbonate minerals out of mineral springs, in particular hot springs. Western China is a seismically active region overlaid in many places with limestone rock. Where fissures carrying geothermally heated water to the surface come in contact with limestone, travertine formations can form around flowing hot spring areas. 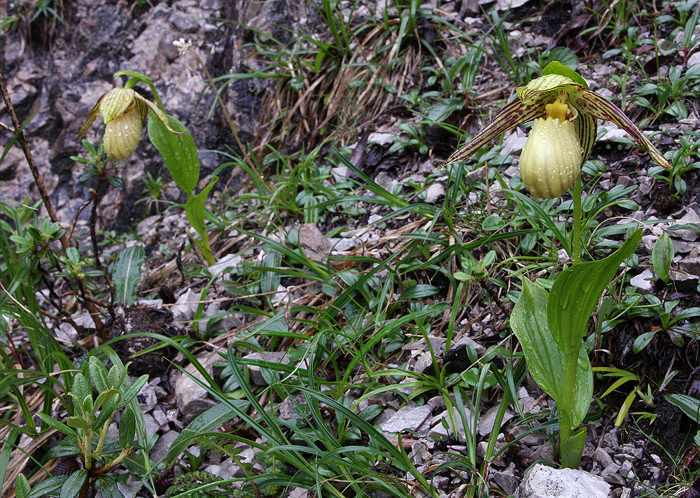 In the high mountains of southwestern China, if you are either very lucky or well informed, or both, you may come across one of the rarest yellow slipper orchids in the world, Cypripedium farreri. As fate would have it I was indeed lucky enough to see this plant in full flower in its native land on a botanical tour lead by Dr. Holger Perner and his wife Wenqing in June 2013. I now am one of the few people who have laid eyes on this rarity in full flower in the wild – to say the least it was an experience of a lifetime! Cypripedium farreri is a deciduous terrestrial orchid of open, rocky, grassy slopes of high mountains. 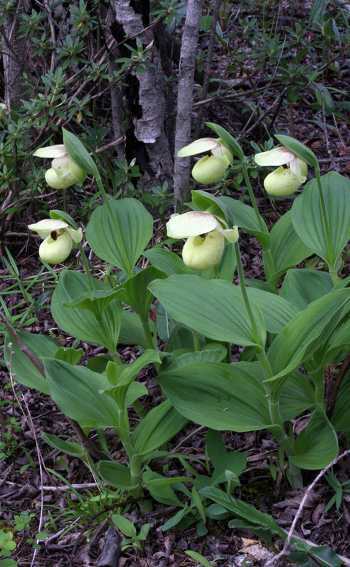 It’s overall appearance is much like other members of section Cypripedium, though smaller, and with fewer leaves. The plant’s stature is quite small, with average plants standing no more than 20 cm tall, and large plants only attaining 30 cm in total height. Each pubescent stem carries no more than three (more commonly two) broad elongate to ovate, pleated leaves, borne alternately. In nature plants tend to be single stemmed, but occasionally can boast two growths. 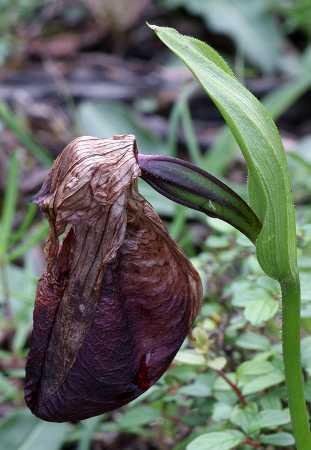 Cypripedium farreri in habitat in northern Sichuan, China. Few have had the pleasure to see this rarity in flower in the wild. The flowers are typically produced singly, but on occasion plants are double flowered and have a natural spread of 7-9 cm each. The flower’s shape is much like other Cypripediums, especially it’s near cousin C. fasciolatum with one caveat, the pouch is “pulled up” around the lip orifice in such a way as to produce a fluted, vase-like shape. The lip also tends to be rather bulbous at its base and its orifice is narrow and deeply toothed – a characteristic seen also in C. fasciolatum, but much less extreme. The sepals and petals are more or less held flat, with some mild twisting, and are quite broad. The lip’s color is pale cream to a dull yellow and notably lined with vertical maroon bars – another signature trait of this plant. The base color of the sepals and petals is bright green-yellow and all are marked with brick red striping. The staminode is yellow and heavily suffused with dark red as is the interior lip orifice and adjacent areas of its inner lining. The flower’s fragrance is much like lily of the valley. 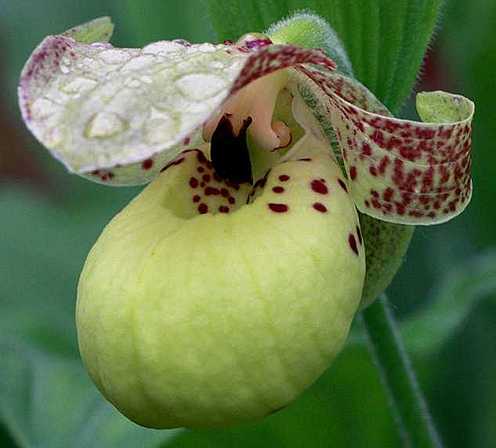 This is one of the rarest of all lady slipper orchids in the world, with only four known localities, all in the Hengduan Mountains of southwestern China, ranging from northern Yunnan in the south, to northwestern Sichuan, and up to southern Gansu (the type locality) in the north. Its habitat is on rocky scree slopes, often near cliffs, in limestone gorges. In the location I visited in Sichuan it grew away from tree cover even in the flatter reaches of the valley, favoring open areas with a little companion herbage other than short grasses and small shrubby herbs. To my knowledge, this is typical habitat for the species, though some sources say it can be found in open woodlands as well. It can be found at 2600-2800 meters elevation in southern Gansu, and up to 3400 meters in Sichuan and Yunnan. A pair of plants growing on a patch of turf amidst a limestone scree slope, ~3300 meters elevation.